A group of consultants in Paris has hatched a plan to turn the Eiffel Tower into a giant tree by covering it with 600,000 plants. Their dream is to literally plant the 324 meter tall aesthetic symbol of Paris with 12 tons of rubber tubing, and gradually add bags planted with greenery all over it to turn it into a growing tree. 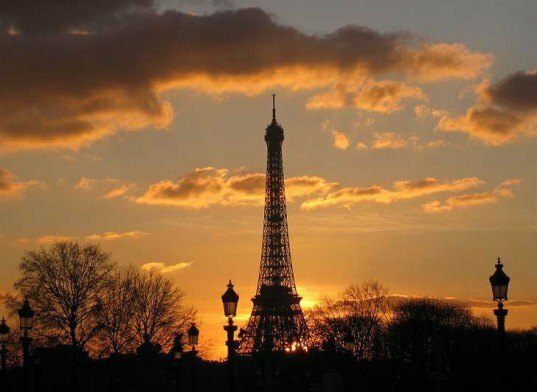 The group says the project would cost 72 million Euros (that’s around 97 million US dollars) and would remove 87.8 tons of carbon dioxide from the air in the city of lights. 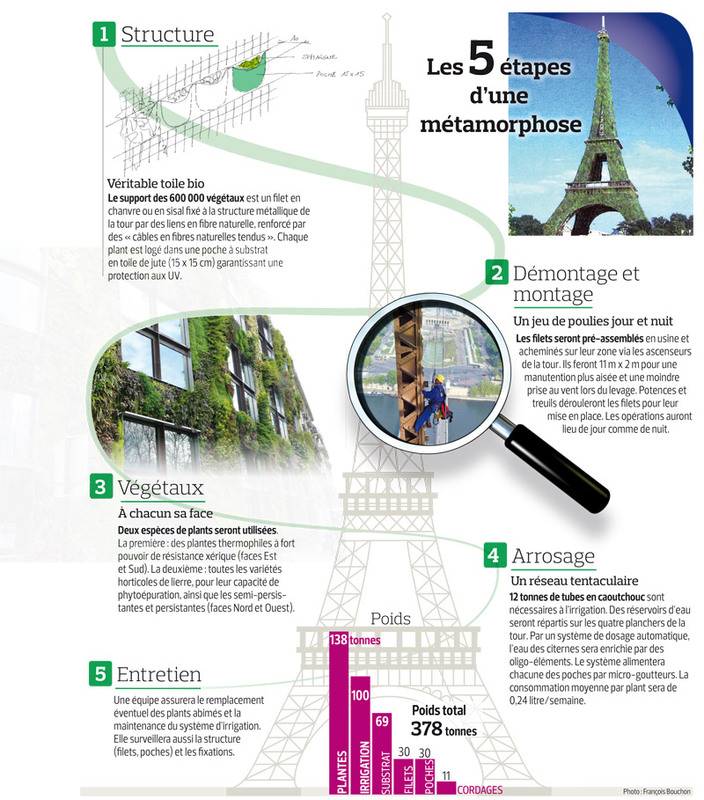 The plan was discovered by Le Figaro and published recently in the newspaper under the headline “The Crazy Plan to Cover the Eiffel Tower in Plants”. The newspaper also published an infographic made by the Ginger Group, the consultants who hatched the idea. The group seems to have thought through many of the structural issues surrounding their plan — the total weight of the plant covering would be 378 tons — and have even designed an irrigation system that would keep the plant covering well hydrated. The group believes that covering the tower in a vegetative blanket would help symbolize to the world France’s commitment to a sustainable future. They’ve gone so far into the planning process that they said they’ve built a small scale model of the project in a Parisian suburb and could start growing the plants for the design this spring in order to be ready to put the plan in action in June. Have no fear, Eiffel Tower romanticists, the sparkling lights that were added to the tower just a decade ago would not be compromised by this plan, The group will add LEDs to their covering so that the tower can still sparkle on the hour every night…that is if anyone in an official position gives this plan the green light. With the costs associated and the feat of engineering involved, we’ll have to go ahead and say this will likely never become a reality. It would be great if someone can make Eiffel Tower sustainable, great image for France and an example to follow worldwide. Sadly, transforming it to a gigantic tree is not the answer. Water consumption will certainly be a big issue, unless they are planing to use rain water for irrigation, i don't know how this project can be sustainable. However, i am interested to learn more about their bold idea! As much as I like the idea, has anyone thought about the extra weight this would create? or how watering the plants could potentially make the Tower rust even faster with the added moist in the surrounding air? "The group believes that covering the tower in a vegetative blanket would help symbolize to the world France’s commitment to a sustainable future." This project strikes me as a commitment to an *unsustainble* future. The high winds and low soil content combined would make for very high water demands -- at 0.25 L/plant per week (as per infographic) x 600,000 plants = 150,000 L/week. If the goal is truly carbon sequestration (? ), there are surely more (financially) sustainable options for less cost and less water. 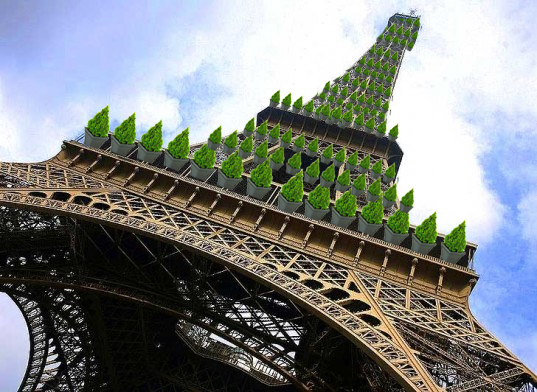 A group of consultants in Paris has hatched a plan to turn the Eiffel Tower into a giant tree by covering it with 600,000 plants. Their dream is to literally plant the 324 meter tall aesthetic symbol of Paris with 12 tons of rubber tubing, and gradually add bags planted with greenery all over it to turn it into a growing tree. The group says the project would cost 72 million Euros (that's around 97 million US dollars) and would remove 87.8 tons of carbon dioxide from the air in the city of lights.